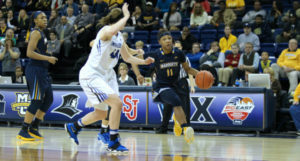 Allazia Blockton became the Marquette women’s basketball team’s all-time leading scorer in the No. 18 Golden Eagles’ 76-57 win over Northwestern this weekend in Evanston, Illinois. Blockton needed 16 points to break the record of 1,940 career points, which was held by Krystal Ellis in 2009. Blockton finished with 21 points, giving her 1,946 in her career. Barring injury, Blockton should soon become the first 2,000-point scorer in the history of the school, male or female.